A freaky realistic strawberry flavored vape juice blend. Strawberry Goodness takes a basket full of freshly picked strawberries with the ideal amount of sweetness with a slightly tart aftertaste. 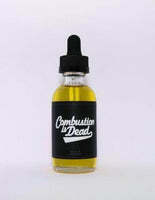 Combustion is Dead E Liquid has cracked the code for making genuine fruit tastes with an amplified edge. Pure, simple but definitely not boring. Strawberry lovers have to try this!